Do you enjoy giving your pet a bath? Most pet owners would probably answer this question with a resounding "NO!" Bathing a pet can draw on your reserves of patience and expertise-- but it has to be done. Dogs, in particular, can get into all kinds of environments that leave them filthy and smelly...from romps in the mud to encounters with skunks. But, even indoor dogs need regular baths as the oils emitted by their skin can attract bacteria to produce that familiar, unpleasant "dog odor." Frequent bathing of dogs can greatly help dogs with skin allergies. Cats may exhibit more care in keeping themselves clean, but they, too, can experience misadventures that leave them in need of a good bath. Additionally, skin problems or pests can cause itching, and scratching or biting at these areas can lead to more complicated medical problems. Using the wrong shampoos on these conditions can just make things worse, so you are always better off entrusting the job to our experienced staff. 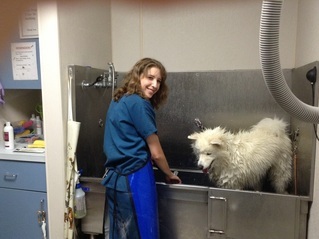 Your pet will love the luxurious bath it receives at our animal hospital! If your pet has a special skin condition, we also offer medicated baths to help soothe their skin and make them more comfortable. We do sanitary trims, dematting and medically indicated shave-downs. We do not have a groomer on our staff, so we do not offer breed specific haircuts. If your dog spends the day with us, he or she will also receive several walks outside and plenty of loving attention. Our boarding services can also provide immense comfort to your pet. Animals get lonely just as humans do, and when you are away your pet can become depressed, frightened and agitated. Our staff treats your beloved pets as if they were our own with plenty of hugs and cuddles, good food and all the other little details that make the difference. Our convenient location in Laguna Niguel, at the crossroads of Golden Lantern and Marina Hills Parkway makes it easy for you to drop your pet off on the way to work or out of town!